Just 11 overs were possible on the final day at Wantage Road as Northants and Kent took 11 points each for the draw. Heavy morning rain cleared up to allow play to start at 2.40pm but bad light brought an early tea and rain prevented any play in the final session. There was time for Daniel Bell-Drummond to move through to his fourth score above fifty this season, reached in 95 balls with nine fours. Kent lost Joe Denly, the unbeaten double centurion in the first innings, caught by Olly Stone running around the long-on fence to give Rob Keogh a wicket. They closed on 131 for two in their second innings, leading by 27. Kent had been bowled out for 396 in their first innings, with Monty Panesar and Rory Kleinveldt both taking three wickets. 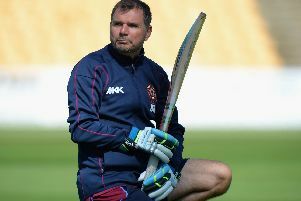 Kleinveldt then smashed 71 with the bat in Northants’ 498 all out, in which Alex Wakely top scored with 87. But Northants couldn’t force a result, enduring their fourth draw in five County Championship Division Two matches this season. The County will now turn their attention to the start of the NatWest T20 Blast campaign at Leicestershire Foxes on Friday night.